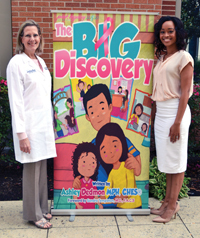 Ashley Dedmon’s book, titled The Big Discovery, is an educational tool that helps families, especially children, navigate the difficult journey that breast cancer presents. The book’s foreword, or preface, was written by board-certified breast surgeon Sandra Templeton, M.D. of Houston Methodist Breast Surgery Partners. As a young woman, Dedmon lost her mother to breast cancer and watched her father battle prostate cancer. With a family history that includes three generations of women affected by breast cancer, Dedmon decided to undergo genetic testing and discovered she was BRCA 2 positive, a leading marker for the disease. After undergoing extensive cancer monitoring for a decade, Dedmon sought out Templeton to discuss other options. Together, they developed a plan to prevent a possible occurrence of cancer – a bilateral prophylactic mastectomy, which Templeton successfully performed in December 2016. The Big Discovery includes sections on early detection, testing and the diagnosis of breast cancer, as well as inspiring stories from survivors and open-ended questions to help prompt discussions with children. Dedmon is now the founder of Pink Legacy 50/50, a platform that educates, equips and empowers individuals who are impacted by breast and ovarian cancer or who are at high-risk for cancer. Visit pinklegacy.com to order a copy of The Big Discovery. To learn more about Houston Methodist Sugar Land Hospital, visit www.houstonmethodist.org/sugarland or for the latest news, events and information follow our Facebook page at fb.com/methodistsugarland.